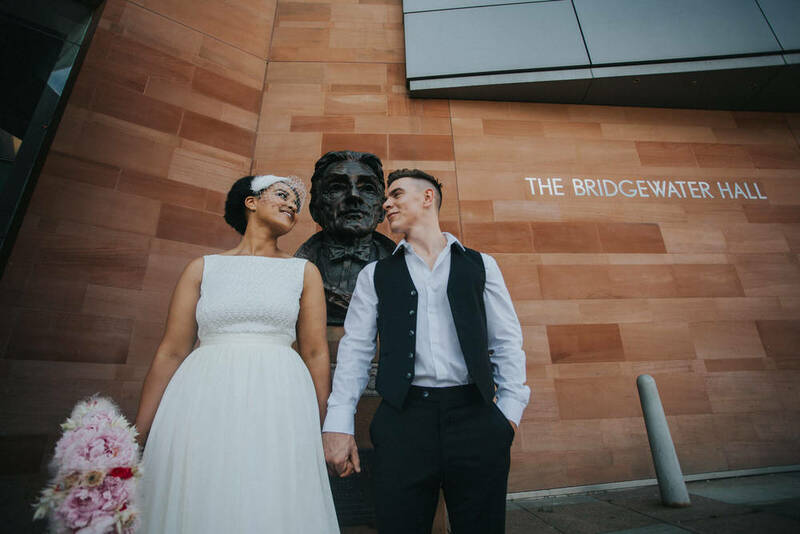 I was recently asked by Bridal Chic in the City whether I'd be up for doing a Bridgewater Hall bridal shoot with them ... the fact that this blog post is full of Bridgewater Hall wedding photographs can only mean one thing - I gladly obliged! 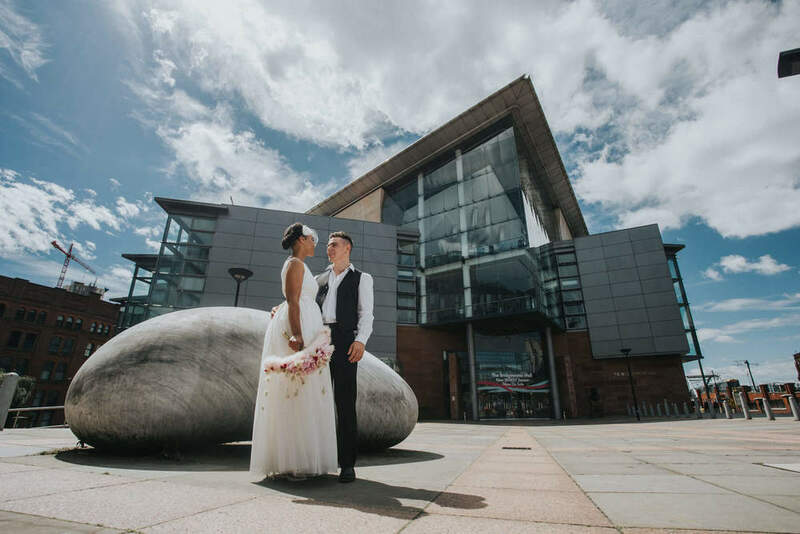 The Bridgewater Hall has recently gained it's wedding license to hold official wedding ceremonies - and so is yet another unique wedding venue to tie the knot in Manchester City Centre. Excitement levels were high/off the scale in the morning - knowing I had this gorgeous space to myself to be as creative and artistic as I wanted. Brilliant! I met up with our two models in the morning; Dee and Aaron. 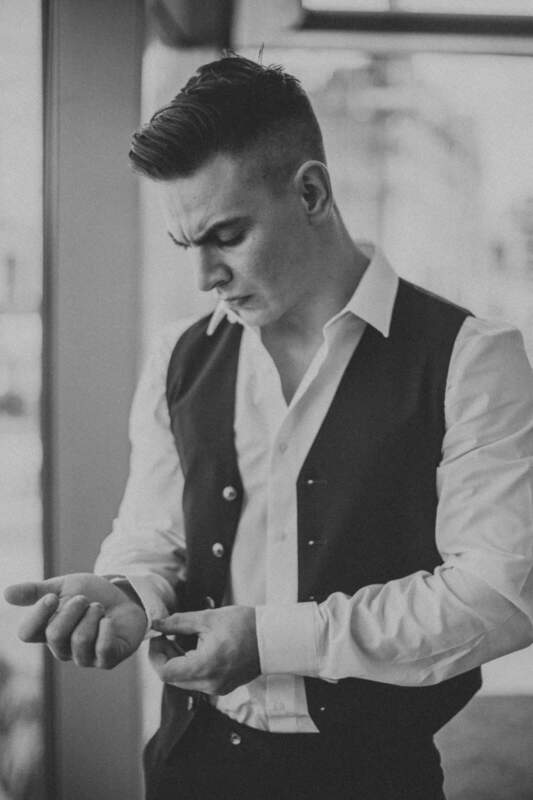 Aaron was being made up by Dee from Soiree Make-Up when we met. Dee's gorgeous dress for the shoot was designed and made by Erica Stacey Bridalwear with turban by Satyrion and Birdcage by Kate Hill. 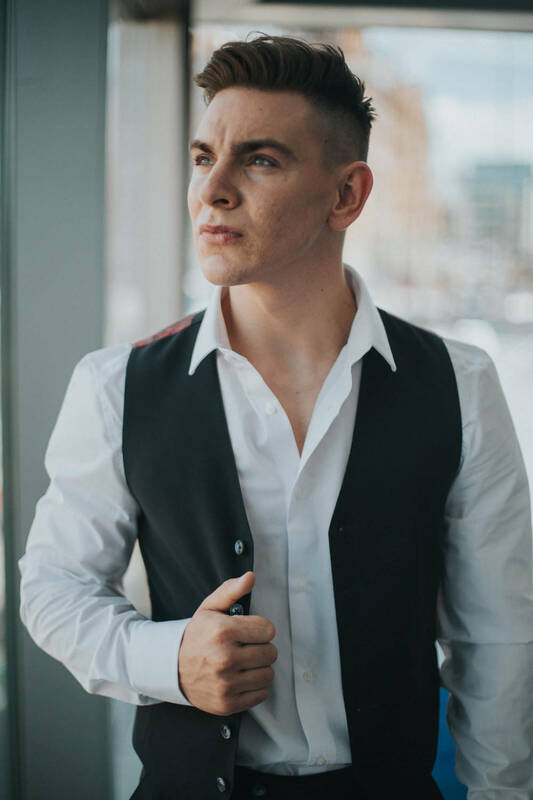 I began the shoot with Aaron, grabbing some alone groom preparation shoots in the window of the Bridgewater Hall overlooking Manchester's Midland Hotel and Deansgate Locks. We then had a wander outside to the loading bay of the Hall. I came across a set of shutter doors which made for a great metallic backdrop for Aaron's portraits, we also had a couple of props - including a Manchester Hallé Orchestra kit case for Aaron to sit on! 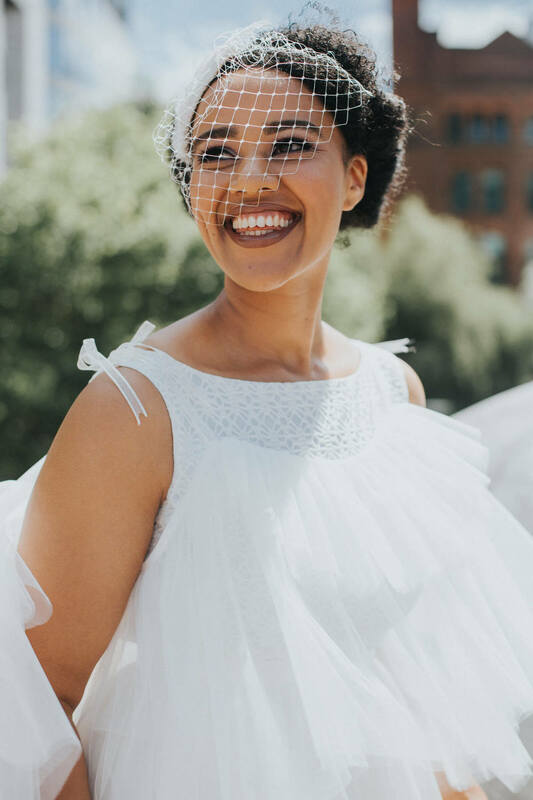 Once we had a good complement of groom portrait pictures, my attention was on our gorgeous bride, Dee, in her stunning Erica Stacey Bridalwear dress. 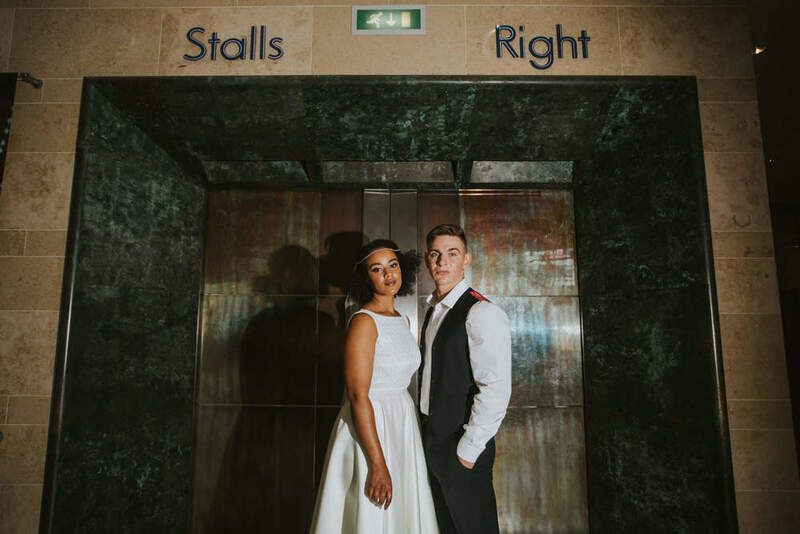 We grabbed some gorgeous portraits in the blinds and windows of The Bridgewater Hall before having a wander around this amazing wedding venue to find the most idyllic spots for our portraits. I really can not wait to come back here as a Bridgewater Hall Wedding Photographer to do it all again!